AND OF THE ESTABLISHMENT OF THE NEW STUDY COURSE IN "SCIENCES OF PEACE"
1. The desire for peace that rises from the human family has always seen the Church striving to make every effort to help liberate men and women from the tragedies of war and to alleviate its dangerous consequences. Even in the present time, in which the need to prevent and resolve conflicts increases, the Church, in the light of the Gospel, feels called upon to inspire and support every initiative that assures to the different Peoples and Countries a path of peace, fruit of that authentic dialogue. capable of extinguishing hatred, of abandoning selfishness and self-referentiality, of overcoming the desires of power and of overwhelming the weakest and the last. Above all, this intent presupposes an educational effort to listen and understand, but also to the knowledge and study of the patrimony of values, notions and tools capable of breaking down tendencies towards isolation, closure and the logic of power that are bearers of violence. and destruction. Means of conciliation, forms of transitional justice, guarantees of sustainable development, protection and custody of creation are today some of the tools able to pave the way for the peaceful solution of conflicts, to break down carrierisms and dominant positions and thus train dedicated people. without reserve at the service of the cause of man. 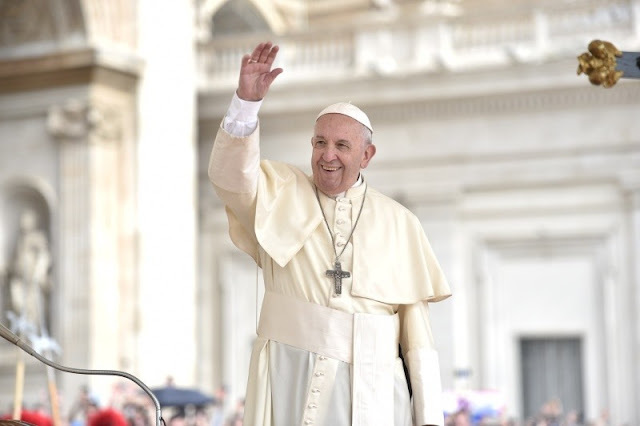 To be a credible mediator in the face of world public opinion, the Church is called to favor "the solution of problems concerning peace, harmony, the environment, the defense of life, human and civil rights" (Apostolic Exhortation Evangelii gaudium , 65). A task carried out also through the action that the Holy See leads into the international community and its institutions working with the instruments of diplomacy to overcome conflicts with peaceful means and mediation, promotion and respect for fundamental human rights, development integral of Peoples and Countries. 2. In the pursuit of this objective, the university world plays a central role, a symbolic place of that integral humanism that continually needs to be renewed and enriched, so that it can produce a courageous cultural renewal that the present moment demands. This challenge also challenges the Church which, with its worldwide network of ecclesiastical universities, can "bring the decisive contribution of the leaven, the salt and the light of the Gospel of Jesus Christ and the living Tradition of the Church, always open to new scenarios and new proposals. », As I recently recalled in reforming the order of academic studies in ecclesiastical institutions (cf. Cost. Ap. Veritatis gaudium, 2). This certainly does not mean altering the institutional sense and the consolidated traditions of our academic realities, but rather orienting their function in the perspective of a more markedly "outgoing" and missionary Church. In fact, it is possible to face the challenges of the contemporary world with a capacity to respond adequately in content and compatible in language, first of all addressing the new generations. Therefore, this is the task entrusted to us: to incarnate the Word of God for the Church and for the humanity of the third millennium. And in doing so, it is important that students and teachers feel like pilgrims called to announce the Good News to all peoples, not being afraid of risking and dreaming of peace for all people and all nations. 3. Therefore, animated by the desire to transpose this patrimony of values ​​and actions into the academic field, I institute at this Pontifical University, which specifically participates in the mission of the Bishop of Rome, a cycle of studies in the Peace, as an academic path to which the theological, philosophical, juridical, economic and social spheres contribute according to the criterion of inter- and transdisciplinarity (cf. ibid., 4, c). The curricular structure will therefore avail itself of the competition of courses taught by the Faculties and Institutes of the Lateran University to confer the academic degrees of Baccalaureate and Licensing at the conclusion, respectively, of a first three-year cycle and a two-year specialization course. 4. Through you, Cardinal, I entrust the new course of study to the University, assigning its direction to the Rector Magnificus, so that a specific scientific formation of priests, consecrated persons and laity is guaranteed. At the Sciences of Peace they will be able to look with confidence to the diocesan Bishops, the Castrens Ordinaries, the Episcopal Conferences, the Superiors and Superiors of the various forms of consecrated life, the Responsible of associations and movements of the laity, and all who wish to promote a adequate preparation of current and future peacekeepers. Faced with this task, I hope that in the daily service to the See of Peter, the entire university community of the Lateran - teachers, students and staff all - feels involved in throwing the seeds of the culture of peace. A work that begins with listening, professionalism and dedication, always accompanied by humility, meekness and willingness to do everything to everyone. I place under the protection of my two Holy Predecessors, John XXIII and Paul VI, true heralds of peace in the world and who have contributed so much to the development of the magisterium in this field, this new fruit of the Church's solicitude, entrusting it to Mary Queen of the Peace, so that it may help us to understand and live that fraternity which the heart of his Son asks and from which true peace derives.